We do this thing fairly often that a lot of people think is crazy. Why would you do something that’s so hard, and with so much potential for disaster? What is that thing, you ask? Coffeeschooling. 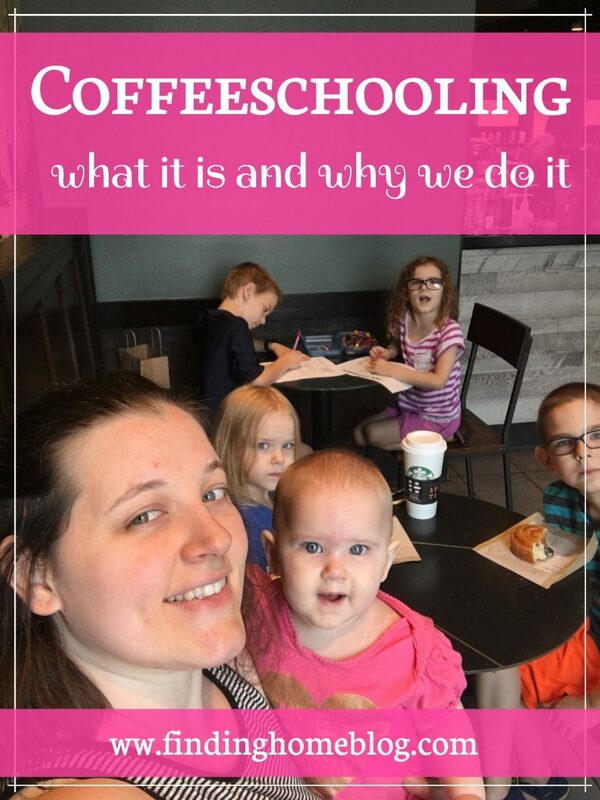 Coffeeschooling is a term that I made up to combine homeschooling and coffee shop. Basically, we take our schoolwork for the day (or at least some of it), and relocate to a coffee shop. It works like this. We will do whatever can’t be done elsewhere first while we’re still at home, usually our extra subject for the day (Science, History, or Citizenship). Then I’ll pack up a bag of worksheets, math books, pencils, crayons, coloring books, and whatever else we might need for that day. We’ll drive to either the Starbucks close to our house (yay proximity!) or to the Dunkin’ Donuts I work at (yay half price treats!) and do our work for about an hour while we enjoy a treat. I was asked once why I do this. Why would you take 5 kids out on your own? Isn’t that hard? My answer to that is that it isn’t as hard as it used to be. I’ve grown into the role of mothering 5 kids out and about, and while we certainly have behavioral issues occasionally, I know my kids and they know how they’re supposed to act. Plus, there’s treats for everyone, and that certainly helps. One of the other reasons we do this almost every week is so the kids can get out of the house. Jesse goes to school 4-5 days a week. I work 4 nights a week. And since we’re both introverts, it would be really easy for us to just stay home otherwise. 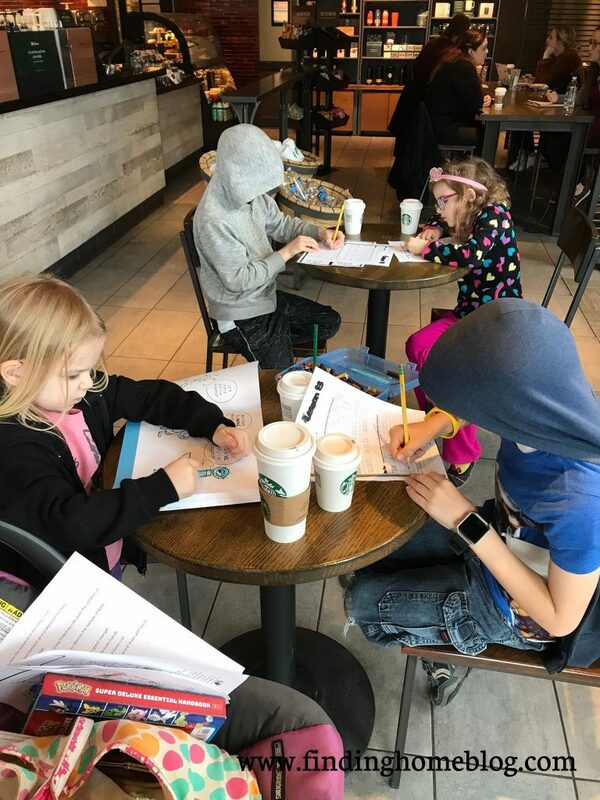 But that’s not really fair to the kids, and this gives them a chance to do something fun outside of the house, besides running errands with me or Jesse or doing occasional educational things with our homeschool group. Since we have different grade levels, I always bring along some extra things for Hannah (age 5) and Elizabeth (age 4) to do while the boys finish their work. Sometimes it’s coloring books, sometimes it’s a few busy bag activities. Something to keep them occupied. Lately they’ve each been picking 2 small toys to bring and they come up with their own little stories to play while the boys work. I do end up holding Sarah pretty much the whole time, unless I feel like chasing her around the coffee shop. She runs around smiling at everyone, which is adorable, but also requires a lot more energy than when she was tiny and would just sleep in my arms the whole time. It’s not always roses and sunshine. One morning we got loaded up to go do some coffeeschooling. 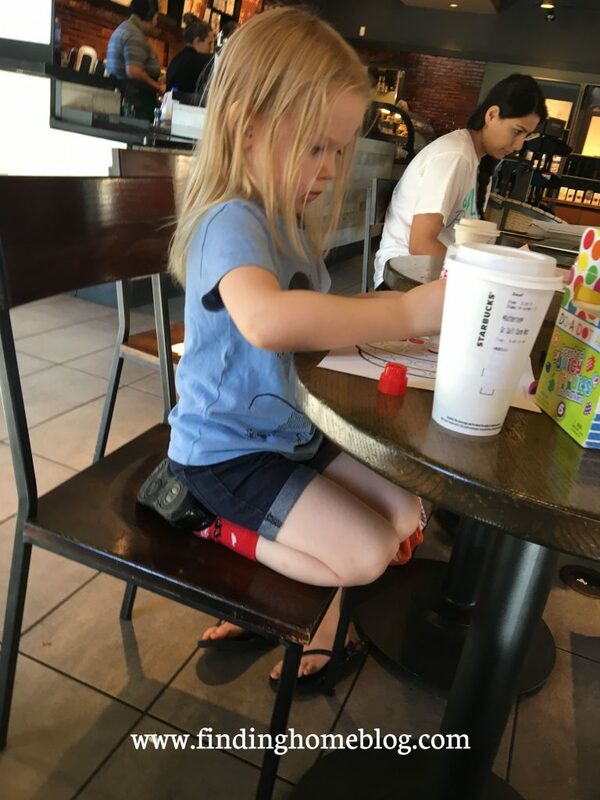 We arrived at Starbucks to find all of the tables completely full, and a couple of the kids had bad attitudes. I could tell that we were heading in the wrong direction for being out in public, so instead we piled back in the car, went through the drive thru, and left. Still, I’ve gotten comments many times on how well behaved the kids are, and how nicely they sit and do their work. And I think part of that is because they know that this is a privilege. They know that most kids don’t get to go sit and eat a donut at 10AM on a Thursday. They know that this is a special thing we do, and that it can only continue if we all work at it. 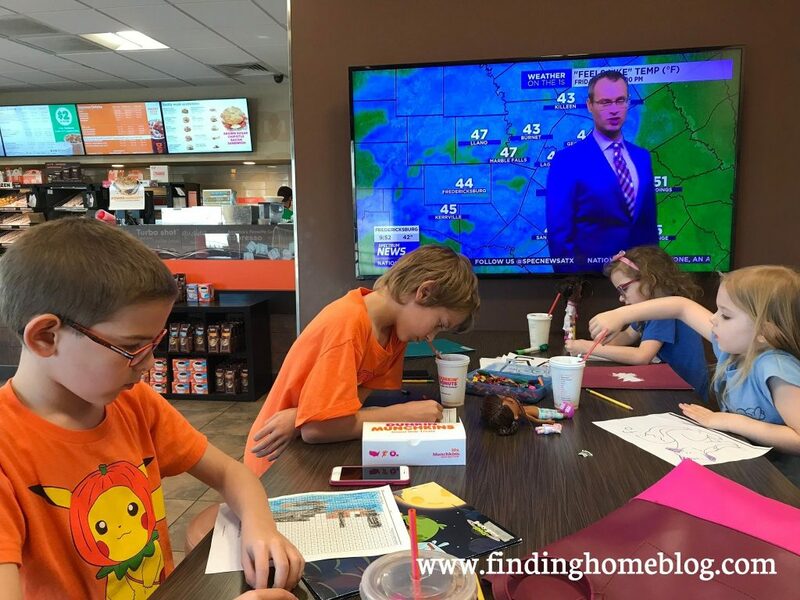 Do you ever take your homeschooling out of the home?